Barrier preventive health, which are often requested by physicians for their Spanish-speaking patients. Although 14 physicians at University Hospitals are bilingual, those who rely on Mrs. Martinez' service find it invaluable. " Mary has helped us tremendously" said Dr. Henry Hamilton, a Professor in the Department of Internal Medicine. " The interpreter program has helped us unravel complex medical histories that have a bearing on symptoms we see in the clinic. In some cases, we've also been able to contact families in Mexico for medical information on patients." Even those who speak fluent Spanish, such as Dr. Ignacio Ponseti, Professor, Orthopaedics, find her services useful. " In the last such patient I treated," [ Translating menus is a job for all ages. " It's more than simple translation because of the names we have attached to foods," says Maria " How do you translated 'Chicken a la King'?" ] Dr. Ponseti said, " Mrs. Martinez had translated the complete history for the resident physician before I saw the patient. Although I could communicate to the parents directly, she was a great asset." In addition to patient contact, Maria spends many hours preparing necessary correspondence with agencies organized to help Latin Americans in the U.S. A sample day [ " I feel that each patient is our guest, and a host goes out of his way to make sure his guests are comfortable." ] might include letters to the immigration bureau to allow a brother in Mexico to visit his dying mother, or a telephone plea to a local migrant worker fund to secure burial expenses for an infant daughter of a migrant worker in Muscatine " I feel that each patient is our guest, " she says, " and a host goes out of his way to make sure his guests are as comfortable as possible. The ultimate is when one of our patients says to me. 'Maria mi pobre casa es su casa' or ' My poor house is your house' and gives me his address. This offer to return our hospitality is the greatest compliment a Spanish-speaking patient can give." Fletcher to New Position Gary Fletcher, Assistant Director for Planning, University Hospitals and Clinics, left University Hospitals August 24 to assume a new role as Administrator of Central Montana Hospital, Lewistown, Montana. 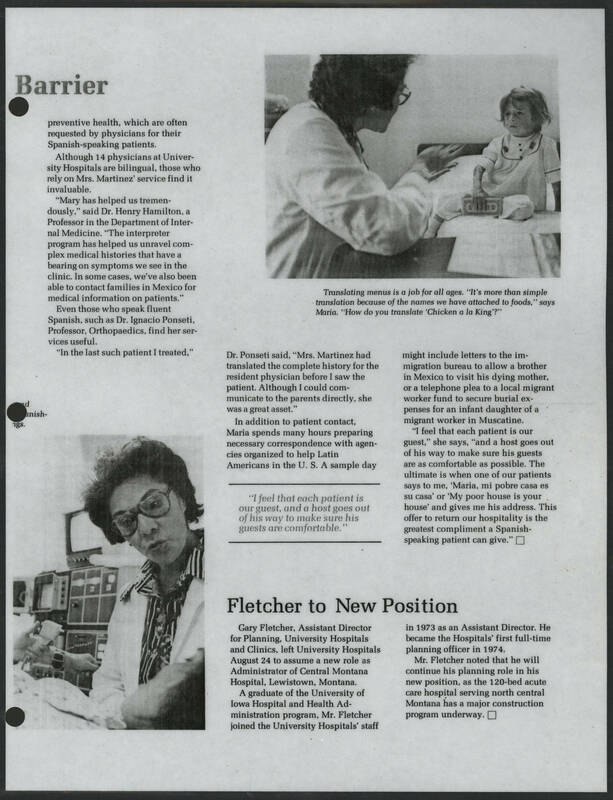 A graduate of the University of Iowa Hospital and Health Administration program, Mr. Fletcher joined the University Hospitals' staff in 1973 as an Assistant Director. he became the Hospitals' first full-time planning officer in 1974. Mr. Fletcher noted that he will continue his planning role in his new position, as the 120-bed acute care hospital serving north central Montana has a major construction program underway.